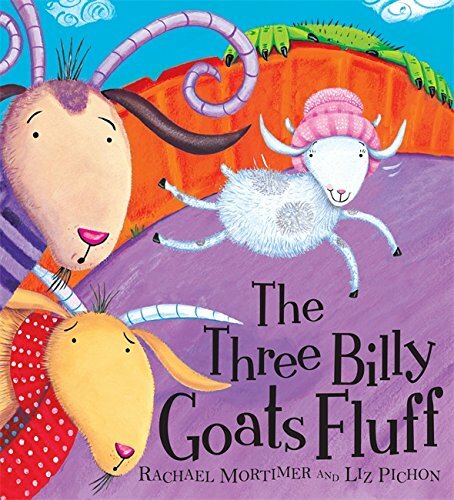 Re-workings of traditional tales can be irritating but Rachael Mortimer’s lively text takes the story line of Billy Goats Gruff to a whole new level of sheer absurdity that works for both adults and children. Mr Troll has moved to a new house underneath a bridge across which the goats of course trip-trap noisily. Mortimer’s allusions to real estate may pass over the heads of child readers but I suspect most children will be charmed by the portentous language and format of the estate agent’s advertisement and demand to know more! Different sizes of text fairly gallop the story along and will evoke an interest in new vocabulary. Liz Pichon’s zany illustrations spin the yarn further still with touches of humour and will amuse the reader even after what I suspect will be many readings. This book works as a appealing stand-alone especially with Mother Goat’s innovative way of preserving Mr Troll’s sleep and sanity so that all is resolved fluffily and happily. I would, though, make a plea that children are offered the hard-edged vigour and excitement of the original tale too!